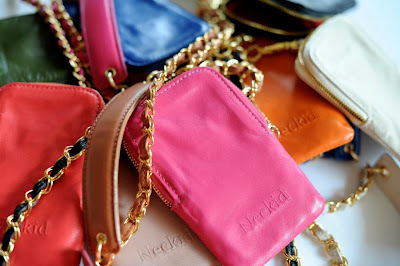 cat eyes & skinny jeans: Neckid: Your New Essential! So colorful. Something perfect for those occasions when you are out and about. Great review! Love these colors! They look like such fun essentials to have! What fun colors. Loved the review! I love the blue Joey. I can totally agree on how you feel about your iPhone because I feel the same way. Ooooooh I need the pink one! And I adore the colors and the cute chain. Definitely a dance floor staple! cute! and i need one in pink asap!! That's interesting! I think it's a great idea...but I'm not so sure if it looks all that great around the neck. If somehow it could look more like a necklace, but still function as a pouch. For now, I think I rather stick with having a wristlet. And thank you for your wonderfully kind comment on my blog. One of the few who understood what I was trying to say! So cute! The pink or the orange would be pretty cool for Summer! What an excellent idea. Seems very convenient! Looks like a great accessory, especially for a night out. I love how it looks like a necklace! The right accessories can change your entire outfit. These are definitely cute and useful for the days when you're walking downtown and you don't want to lug around a bag, or if you're dancing the night away! PS. It's been too long! But I always read your posts, and love them to bits. Oh what a great review! The colors are so pretty!! Great idea - love the pink!